Leaf gold, from Gwynfynydd Mine, in the Dolgellau Gold-belt. The specimen measures 40 mm x 20 mm. Miners at the Clogau gold mine in the 1900s. Another gold mine lies nearby, the Clogau mine. After producing copper and a little lead for quite a number of years, the mine developed into gold production in the 1862 gold rush and continued as a major operator until 1911 during which time 165,031 tons of gold ore were mined resulting in 78,507 troy ounces (2,442 kg) of gold. It worked the St David's lode of Clogau mountain alongside the co-owned Vigra Mine. Since 1911, the mine has been re-opened several times for smaller scale operations. It last closed in 1998. 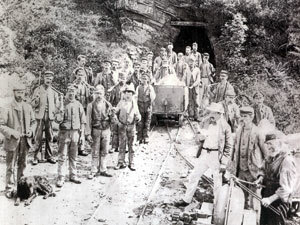 Workmen at Dolaucothi gold mine with a bar of gold mined from the site in February 1938. The earliest known Welsh gold mine was the Dolaucothi Gold Mines near Pumsaint in Carmarthenshire, which was initiated by the Romans in or about 74 AD, and closed in 1938 and was donated to the National Trust in 1941. A hoard of gold objects was found near the village of Pumsaint close to the mines in the 18th century and is now in the British Museum. However, Dolaucothi is best known for its exploitation on a large scale during the Roman period, from about 75 AD on to 300 AD at least. Hydraulic mining methods preceded opencast and then deep mining at the site. The many opencast workings were produced by hushing and fire-setting during the Roman period in Roman Wales The workings were initially under military control with a small Roman fort under the present village of Pumsaint and the workings have yielded large amounts of late Roman pottery (77 AD to 300 AD plus) from the reservoir known as "Melin-y-milwyr" or soldiers mill. The Dolaucothi mine is open to the public under the aegis of the National Trust and visitors can explore the many surface features at the site, as well as be escorted on a tour of the extensive underground workings. The Dolgellau gold belt in Snowdonia, Wales. The main Dolgellau gold belt runs in an arc from the coast at Barmouth, west of Dolgellau, to the north-east of Ganllwyd. 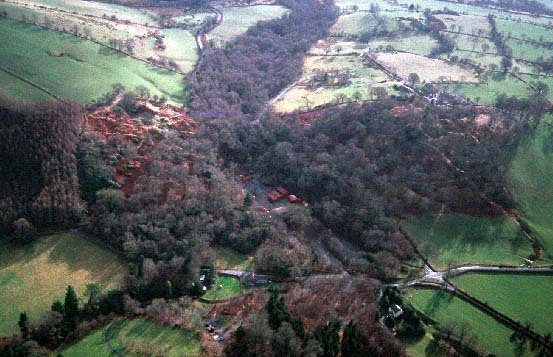 Two mines, Clogau and Gwynfynydd, produced most of the area’s recorded gold. The Dolgellau Gold-belt veins are the oldest in Wales dating from early Ordovician times. At that time, a major volcanic cycle was coming to an end. A great volcano had built up in the area that is now the mountain of Rhobell Fawr, while deep underground magmas had been injected as sheet-like masses into the Cambrian sedimentary rocks. In the closing stages of the volcanic cycle, uplift occurred and the tensions that developed within the rocks caused fissures to open up. The fluids found their way into these, and their payload of metals was deposited, as gold and the other vein-minerals of the area. Miners at the Clogau gold mine in the 1990s. Since 1911 the mine has been re-opened several times for smaller-scale operations. It last closed in 1998. In 1999 the mine was taken over and held by a local exploration company. 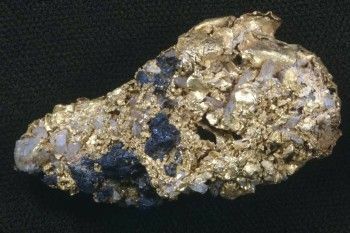 Rock containing Welsh gold from the Clogau gold mine. Within every piece of Clogau jewellery is a touch of rare Welsh Gold from the Clogau St. David’s Gold Mine in Bontddu (“bont-thee”). This is undoubtedly one of the rarest, most expensive and most sought-after gold’s in the world.